A spinal tap is a procedure performed when a doctor or health care professional needs to evaluate the cerebrospinal fluid (also known as spinal fluid or CSF). Spinal tap is also referred to as a lumbar puncture, or LP. To evaluate for uncommon diagnoses such as multiple sclerosis, Lyme disease, Guillain-Barré syndrome, and several others. Cerebrospinal fluid is a liquid that bathes the brain and spinal cord. An adult has about 140 mL (just under 5 oz) of spinal fluid. Typically, an adult makes 30-100 mL of spinal fluid daily. A spinal tap can be performed in any person and at any age. The spinal cord ends at the level of the first or second lumbar vertebrae, and the needle is usually inserted at a level between the third and fourth or the fourth and fifth lumbar vertebrae, keeping the spinal cord completely out of danger. Although very infrequent, several complications can occur as a result of a spinal tap. A few people get what is commonly referred to as post-lumbar puncture headache. The headache may start up to 48 hours after the procedure and usually lasts for two days or less. The headache typically worsens in an upright position and lessens lying flat. The chance of getting one of these headaches is reduced by drinking plenty of fluids, especially caffeine products such as tea, coffee, and cola. Occasionally, the only way to treat the headache is with a procedure called a blood patch. An anesthesiologist or pain management specialist injects a small amount of your own blood at the site where the spinal tap was performed. You usually experience relief within 30 minutes after this procedure. A herniation can occur if an abscess (pocket of infection) or increased intracranial pressure (ICP) is present during your spinal tap. If the pressure in your brain is elevated when the spinal tap is performed, the flow of fluid from the brain down the cord may cause the brain to get squeezed down into the direction of the spinal cord. This is extremely rare and occurs only with significantly elevated intracranial pressure. If a person has signs and symptoms consistent with meningitis (fever, headache, and stiff neck), then the spinal tap may be performed immediately to avoid delays in treatment. In some people, a CT scan of the brain is performed first, however, to rule out the possibility of bleeding or other causes that may increase the pressure within the skull or around the brain. If increased intracranial pressure is suspected, great caution is taken and your condition is carefully discussed before a spinal tap is performed, if it is performed at all. Injury to the blood vessels that surround the covering of the spinal canal may occur when the needle is being inserted. Frequently referred to as a traumatic tap, this may cause a small amount of localized bleeding. Sometimes this can affect the results of the procedure, which would mean that the doctor would have to reinsert the needle into another area of the back, frequently an inch or so away from the first site. Proper numbing medicine, if needed, is injected to decrease any pain. Rarely, certain tissues (epidermoid) are accidentally implanted into the spinal canal when the spinal tap is performed. The likelihood of an epidermoid cyst is much greater when a needle without a stylet is used, and this almost never occurs today. All spinal tap kits used today have needles with stylets. No special preparation is needed on your part before a spinal tap. Always ask your doctor to fully explain the process to you as she or he is doing it. This talking through helps to lessen any anxiety that you may experience. Most spinal taps can be completed within 10-15 minutes. The doctor always uses sterile technique including wearing sterile gloves. The spinal tap is performed using sterile technique, meaning that everything used is sterilized to minimize any risk of infection. The doctor next identifies the correct place to insert the needle by orienting herself toward landmarks on your body. Frequently, the doctor does this by feeling the top of the pelvis bone (on your side). This area corresponds with the fourth and fifth lumbar space where the needle is inserted. Once the area is identified, it is prepared in a sterile fashion, which usually involves applying a liquid cleansing solution and drapes. A numbing medication (lidocaine) is injected first into your skin and then into the deeper tissues of your lower back to numb the area completely. This injection causes some minor discomfort, which is usually brief and has been described as a burning sensation. You should inform the doctor at any time if you feel pain when the procedure is being performed. The needle is then inserted in your lower back, usually at the third and fourth lumbar or fourth and fifth lumbar level. The needle passes between the two vertebrae to enter the space where the fluid is contained. Placing you in the fetal position allows the vertebral spaces to open more widely to make needle passage easier. Occasionally, the doctor may measure the pressure within the fluid containing area. This does not change the procedure nor does it affect the results. The fluid is then allowed to collect into a series of three or four vials that are then sent to the lab for evaluation. The fluid collects passively, meaning it is allowed to drip out into each vial at its own pace. This step can take several minutes for a full specimen collection. After the fluid is collected, the needle is removed and a bandage or small dressing is placed over the area. You may be asked to lie flat on your back for a time after the spinal tap. This is to reduce the possibility of headaches. Drinking fluids, especially caffeine products such as tea, coffee, and cola can also help to reduce headaches. Your puncture site may be sore for one to two days similar to soreness in your arm after receiving an immunization or having blood drawn. As with any procedure where the skin is punctured, the area should be monitored for signs of infection. Redness, swelling, pus from the area, or increasing tenderness to touch should prompt immediate attention from a doctor. Depending on the reason for the spinal tap, you might be admitted to the hospital or asked to follow up with your doctor. If the tap is performed in the emergency department, the some of the results are typically given to you at the time of the visit while others often are not available for 24-48 hours. If the spinal tap is performed in a doctor's office, then a follow-up telephone call may be suggested, or a follow-up appointment may be scheduled to discuss the results of the tests, especially if specialized testing is ordered. Rarely, an infection may develop at the site where the needle was inserted may occur. Signs and symptoms include redness, swelling, tenderness, or pus from the site. Headaches can occur after a spinal tap and occasionally may be severe. If this occurs, you should contact your doctor. Any signs or symptoms of infection or severe headache should prompt immediate attention from your doctor. If you are unable to reach your doctor, then you should seek immediate attention from your local emergency department. The lower portion of the back, or lumbar region. The doctor is pointing to the area where the needle will be inserted between the third and fourth vertebrae. Notice the other hand on the top of the pelvis bone serving to help locate this area. (For orientation purposes, the patient is on their right side with the head off to the right side of the screen.) Click to view larger image. An example of the sterile technique used. A drape is placed around the area (the blue sheet), and then the needle is put in place. (The glass tube going up from the needle is the device used to measure the pressure of the fluid itself.). Click to view larger image. The fluid is allowed to collect into each of the vials so that it can be sent to the lab for analysis. Click to view larger image. The doctor and possibly a nurse or a technologist will be in the room with you during a spinal tap. Pre-medication may be given to help you relax. You will wear a hospital gown during the test. You will either: Lie on your side with your knees drawn as close to your chest as possible and your chin toward your chest; or lie on your stomach with a small pillow beneath your lower abdomen. After cleaning your back with an antiseptic, sterile cloths will be placed around the area. A local anesthetic (pain-relieving medication) will be injected into the area of your back that the fluid will be drawn from. You may feel a slight burning sensation. 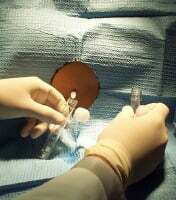 When the area is numb, a hollow needle is inserted in the lower back between the two lumbar vertebrae. This sometimes causes pressure. 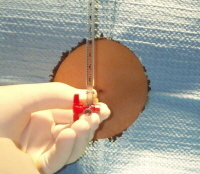 The spinal canal is penetrated, and fluid is collected (the spinal cord is not touched by the needle during the test). The needle is removed after the fluid is removed. The area will be cleaned with an antiseptic and covered with a small bandage. A blood sample may be taken from a vein in your arm and tested, along with the spinal fluid, in the laboratory. Euerle, B.D., Roberts JR, Hedges JR. "Spinal puncture and cerebrospinal fluid examination." In: Clinical Procedures in Emergency Medicine. 5th ed. 2009: 1107-1127. Did you receive a spinal tap? Please describe your experience.